Aditi Phadnis reports from Lucknow. The smell of paint is still in the air and the varnish on the door-frames is barely dry. The building is new. So, there are no red paan stains on the walls yet. The mansion, the Janeshwar Mishra Trust on Lucknow's Vikramaditya Marg that will house Akhilesh Yadav's party-that-is-not-a-party, is a buzzing hive of activity. Here, it is all black and white: The only grey is in the hair of less than half-a-dozen elders who form part of the nucleus of the rebel chief minister's think team. His followers have the clear-eyed certainty that only the very young enjoy: "He only wanted to drive out undesirable elements (avaanchhaniya tatva) from the party and drive home to the people all that his government has done in its tenure. That's all," said an Akhilesh supporter, adding politely: "Please come to the La Martiniere ground tomorrow (Thursday). The crowds will be in millions." On November 3, Akhilesh will launch a 75-km yatra from Lucknow to Unnao to spread the word about the development done by his government. His father Mulayam Singh Yadav has been requested to flag it off. 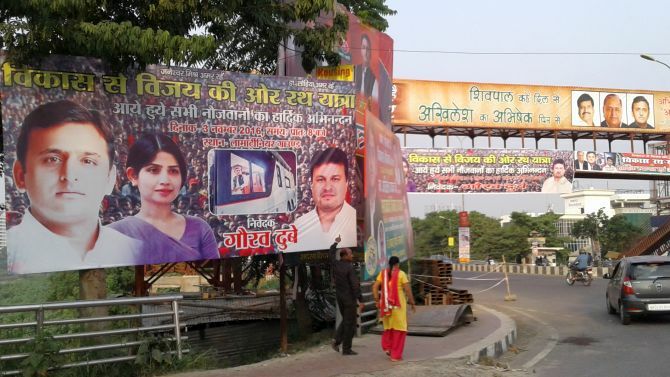 It is an unspoken dare to uncle Shivpal, whose name and picture are missing from the banners and posters plastered all over Lucknow, as if to invite the party and people to make a comparison between the crowd that Akhilesh's men will gather opposed to the size of the rally on November 5 to celebrate 25 years of the formation of the Samajwadi Party organised by Shivpal. Originally, the task was given to Gayatri Prajapati, a disgraced minister and an important protagonist in the family war. But his father died and he had to recuse himself: The task then fell on Shivpal. Clearly, despite Shivpal's protestations that he never objected to Akhilesh's appointment as chief minister and will not do so in the future should an opportunity arises, the younger people in the party remain unconvinced. The Samajwadi Party can win the 2017 assembly election only if it gets more than 200 seats out of 403 in the UP assembly. Akhilesh's plan is simple: He wants to lead the party on the strength of the infrastructural development his government has done, capitalise on the massive sympathy wave of young people in the state who dream of doing what he has managed to do -- defy a feudal, greying orthodoxy that occupies and sits on posts and positions never to leave. There is also support for his attempts to cleanse the party: Starting from the 2012 when two leaders who have murder charges against them (D P Yadav and Atiq Ahmad) were offered nominations by the Samajwadi Party. D P Yadav never got anywhere, but Atiq Ahmad was axed, but brought back in 2014 to contest the Sravasti Lok Sabha seat that he lost. After that, it has been a battle against the Quami Ekta Dal and others, largely at Shivpal's insistence. Akhilesh then posted a fiercely independent IAS officer, Aradhana Shukla, as the bureaucrat in charge of the Public Works Department, a portfolio Shivpal was handling. The Rs 1,300 crore (Rs 13 billion) Poorvanchal Expressway was in the making and contracts worth thousands of crores of rupees were to be given out. All this was subterranean politics, but the tug-of-war was lost on no one, least of all the contractors who had invested in Shivpal and the Samajwadi Party. The younger elements also saw the way Akhilesh struck out at a strong Shivpal supporter, Gayatri Prajapati, who is also a big supporter of Akhilesh's half-brother, Prateek. The Lucknow cognoscenti is watching the next few days with excitement and trepidation. Many believe if Akhilesh had announced a parting of ways from the SP, joined hands with the Congress and other anti-Bharatiya Janata Party groups, the Muslims would have got the message that the SP is the only way the BJP can be beaten back. All the compromises and mistakes of the Akhilesh government -- not taking strong enough action in the Dadri lynching case, the state government's inaction in communal rioting in western Uttar Pradesh, and his lack of a reaction in the killing of eight undertrials who were allegedly members of SIMI -- that have left the Muslims in UP deeply worried, would have been forgiven. But his equivocation has cost him Muslim supporters. And, the net gainer: The Bahujan Samaj Party's Mayawati. Does Akhilesh Yadav have a plan?